We partnered with Ford to change the way we think about car customizers by creating the ultimate experience for the Mustang, the most customizable car in the world. We then aimed to top the previous version with a few major upgrades to the Flash-based concept. The revamped customizer offered four new base model cars to work with. There were multiple perspectives, angles and high-resolution images of real Mustangs that the user could repaint with the help of a diverse color palette. The introduction of Battle Mode helped push the customization experience into the social atmosphere by pitting users’ designs up against their Facebook friends or by letting them go head-to-head with complete strangers. To up the ante on close friends, Nemesis mode allowed Facebook friends to vote on the rivalry in a hot-or-not style format. To reward user participation, badges could be won for voting, win percentages and recruiting. 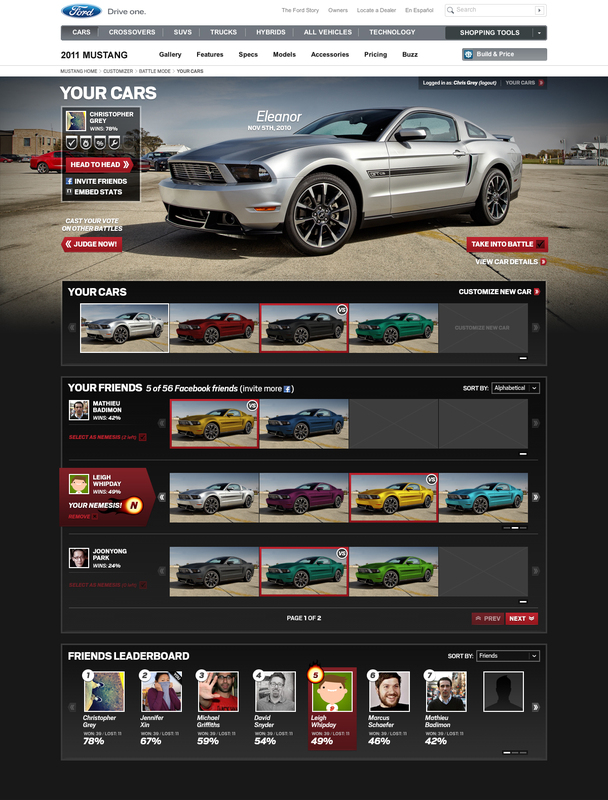 Statistics for earned badges, battle history and designed cars could be found on the user’s main profile. 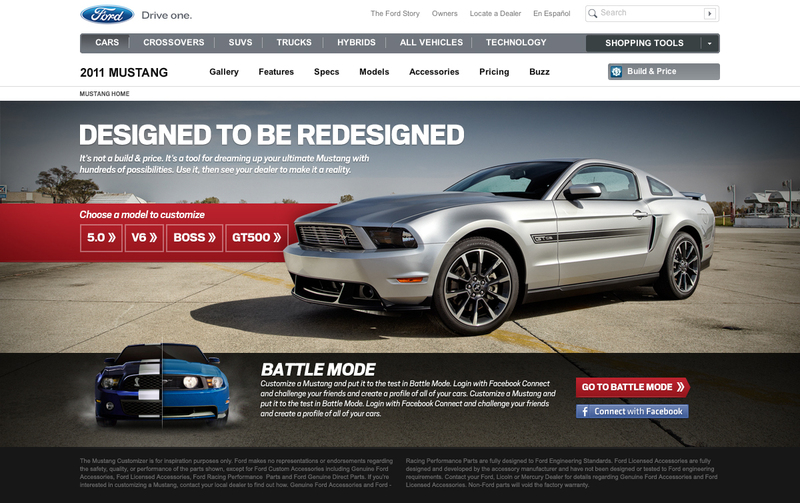 Bonuses included downloads of customized cars as desktop wallpapers and specs of users’ Mustangs that included all stock, aftermarket and concept parts and accessories. 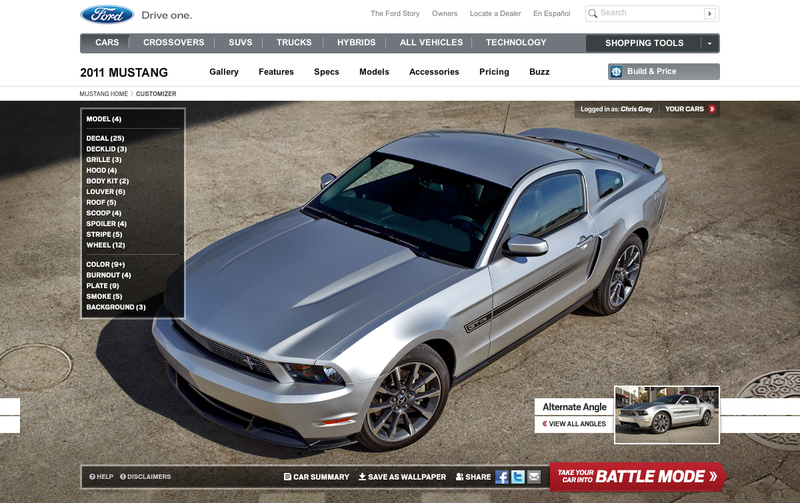 Once again, fans could customize a Mustang like never before.